I must admit, I hate watching movies in class. Everyone usually groans when the teacher announces what we are going to watch, and therefore everyone watches the movie with this instilled hate, which means they refuse to like it. Mind you, the kinds of movies we watch at school are very standard...ones I can remember watching since I started high school are Wild Child, Avatar, Forrest Gump and Ferris Bueller's Day Off (now that one was awesome). Anyway, for drama we are doing some scenes from 'The Diary of Anne Frank'. First off, we watched the 1959 version of the movie (which was good). After we finished that, we got into a bit of a discussion about the Holocaust, before me and the teacher started telling everyone about Schindler's List. The next day I brought the movie in for all of us to watch, just so we could get a better understanding of the Holocaust. Let's just say, this is probably the best movie I've watched at school. Even though I've already seen it, I felt that this time I got a better handle on it. 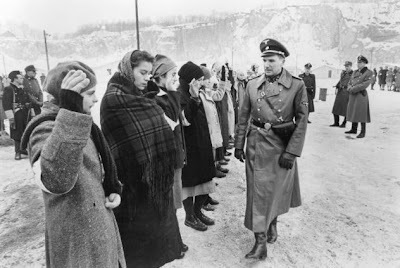 Schindler's List is the story of a man who didn't care much for anything but money and power, but then he came to change his mind when he saw first-hand what was really happening to these Jews. Now this might seem like your average inspirational flick that has so much hope in it you feel on top of the moon while watching it. But for one thing, we all know the Holocaust wasn't a very hopeful time at all. For the most part, we know the inspiration is there, but there it isn't that so-happy-you-feel-sick sort of inspiration. Instead, the movie is just so horrible to watch that you feel sick, with the greater good of a human making this an unforgettable experience. At the beginning of the film, we are introduced to Oskar Schindler (Liam Neeson), who has scraped together every cent he has so he can go to a fancy restaurant and dine with some fellow members of the Nazi Party, eventually bribing them to sponsor his business: a factory which makes cookware for the army. Here we see the Schindler who wants money, and wants it bad. Once he has it, he uses it to send lavish gifts to some powerful figures in the SS. The best thing is that he hires Jews to do all of the work at his factory, who come at very cheap rates. So here Oskar is, well on the road to having more power and money than he has ever had before, taking advantage of everybody's vulnerability during the war: the Nazi's because they want to be lavished more than anything and the Jews because they just want to stay alive as long as possible. 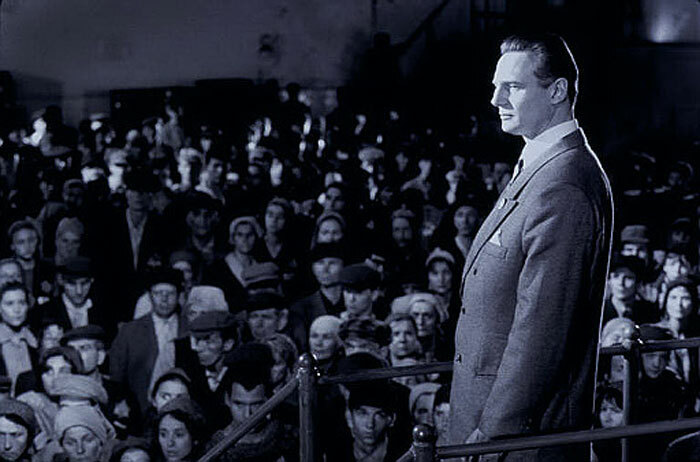 Schindler's big introduction is, in my opinion, one of the most beautiful things that I've ever seen. The camera goes around him as he navigates his way around the club, looking even more suave thanks to the carefully placed smoke coming from his cigarette and his appearance in black and white. I reckon this is the moment when I just fell completely in love with Liam Neeson. His presence in this film is compelling. From the start, you can't tell whether this guy is capable of so much good. He just weasels his way to the top, without little thought for anyone else. But there's that scene where he rides up to watch the liquidation of the ghetto in Krakow, and he sees the iconic little girl in the red coat, that he is compelled to make a change. Schindler makes a change, by hiring these Jews to work for him, basically saving them all from being gassed. He makes a list of all the Jews he needs as 'essential services', which means they shouldn't be put on the trains to Auschwitz. Along with saving almost 1,200 lives, he also refused to contribute to killing in the war by producing faulty ammunition. While the guy was a truly inspirational figure for the things he did, he wasn't the kind of guy who was filled with positivity and spread glitter around everywhere because he was God. He only really cared about money all along, he did dodgy dealings with the black-market and he slept with countless women even though he was married. 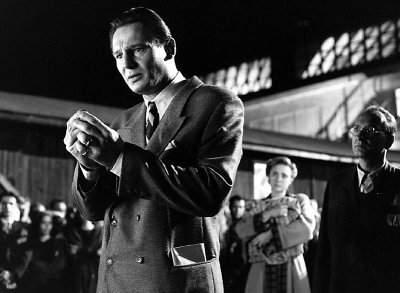 When sorting the good guys from bad, Schindler will always be at the top of the good guys list, but there are those flaws there to remind us that he is only human, not God. Even though he achieved so much, Schindler felt overwhelming guilt by the end of this movie, because he felt that he could have saved more Jews by selling his possessions to buy them. The scene where he is thanked by the Jews with a ring and a letter describing his actions and he breaks down was beautifully played by Neeson. He felt that he could have done more, even though he had done more than enough. Which was the moment when this film became truly inspirational, and when Schindler is established as a wholly good guy. 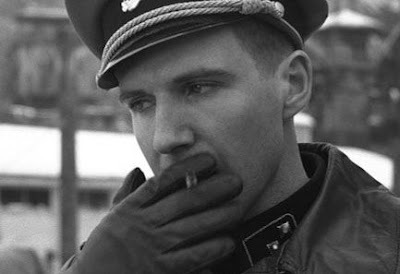 Along with the beauty and horror of this story, another thing which I absolutely loved about Schindler's List was the performance from Ralph Fiennes as SS-Lieutenant Amon Goeth. Our class all pretty much agreed that he was a hell of a good-looking man but he was a complete psycho. The best thing about his performance was the fact that when there was a close-up of him, you'd look into his eyes and it was like he was nothing. It was like he was empty, drained of life, drained of any humanism. He just kills because he feels he has to. He doesn't get joy out of shooting a whole lot of Jews - he gets joy out of feeling like he has some sort of authority over everyone else. I'm sure he didn't just wake up and decide to shoot someone from his balcony because he wanted to kill someone - he did it so everyone knew that he was around. He wanted everything to go his way, because he was in power. So what if he didn't feel anything? He was little more than a boy getting a gun and being told to kill the people who remotely pissed him off. But he didn't kill Helen Hirsch (Embeth Davidtz) - he beat her because he cared about her, and that was his way of showing power around someone he felt any sort of emotion for. I liked how when he went down to the cellar and found Helen down there, he started off talking to her all edgy, like a boy with a crush. This was a completely different side to him which Helen didn't buy because she knew first-hand how horrible he really was, which in turn, made him go back to his usual self. It is hard to play someone so empty and power-hungry at the same time, which is why I loved Fiennes' performance so much. It is probably the best male performance that I have ever seen. 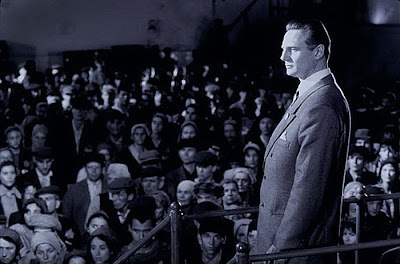 To me, Schindler's List is a perfect film. The black-and-white cinematography was absolutely impeccable, and made the movie far better. With colour, the film may have become dated and would have lost most of it's haunting vibe. However, thanks to the black-and-white this is a timeless classic, perfectly capturing the story. Steven Spielberg's direction adds a lot of humanism, and definitely puts most of his other films to shame. Everything technical is brilliant in this film...so carefully crafted. The performances from the entire cast are all heartfelt, even the ones from the several secondary cast members who played many of the Schindler Jews. Ben Kingsley has a particularly restrained performance as Schindler's accountant Itzhak Stern, which I found to be quite poetic for some strange reason. It has a brilliant mix between good and bad; showing many scenes encapsulating the horrors of the Holocaust without portraying the Jews as exactly what the Nazi's thought of them: helpless animals. Instead, many of them are given true identities, and you feel their fear and eventual gratitude. At the end you see the real Schindler Jews coming to put stones on his grave, there is no doubt that it will fill you up with hope and inspiration. These people went through hell, but they survived thanks to a man who had enough compassion to give some people a chance at life that they had the right to have. He saw above what many other people saw. He even saw above what he really wanted to gain in life. His life after the war wasn't brilliant either, as he still had to hide from the many people who disagreed with his actions, and he failed at marriage and attempting to make good business. He later died without any money. But thanks to this film, no one can forget what a good influence he had on the future of the Jewish people. He left 1,200 people to continue on for generations and generations. He wasn't a completely good person, but he was a human, and he saw other humans for what they were. And that, to me, is why this film is so inspirational. 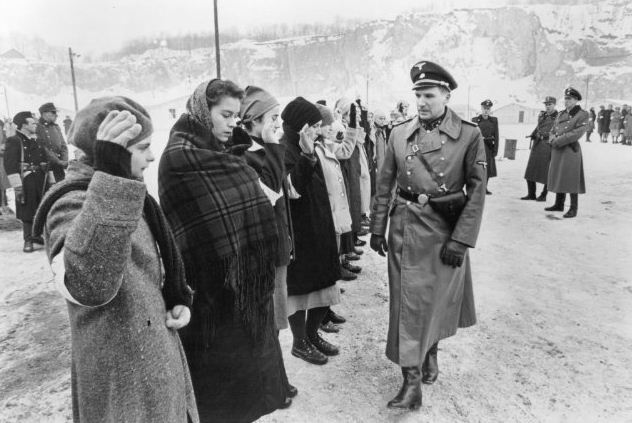 What are your thoughts on Schindler's List? Is it one of the greatest movies ever made? Did you find it inspirational? I first saw it years ago, and I must say I did enjoy it, although I never showed any particular love for it. It's definitely one I need to revisit. In fact, I might get a chance to do so in the next few weeks since I'm working on a Holocaust movie-themed post. Great review, by the way, and I was surprised to hear you label Fiennes' performance the best you've ever seen. I don't really remember it that well, so obviously that's another reason I need to see it again but my favourite male performance ever can be summed up in one word: milkshake. I watched this at school as well, but we were only meant to watch certain scenes to get a better idea of the holocaust. Our teacher was away however, so the sub decided we'd watch the whole thing. It really is a magnificent film, but I haven't watched it again, too difficult! Liam Neeson made me cry! Its amazing for sure and Ralph Fiennes he is awesome, too awesome. I have seen the movie a few times and every time i saw it Ralph impressed me so much more and so did Liam, at a point I was in awe of these two actors and so much that I dug up their movies and saw them one after another. If you look at the scene where Ralph's character gets up one morning and just takes his gun out and standing in balcony , there is a actual picture of the character played by him in the same pose and Ralph actually put on that slight bulge to get in that exact shape. Inspirational at a certain levels yes, but may be I need to see it again to seek more. One of the greatest movies definite , at least one of the greatest I have seen , its brilliant and one of the best I have seen from Mr. Spielberg. Tyler - Yeah, I didn't show any particular love for it when I first saw it, but now I've watched it again I think it's probably in my top 10 favourite movies of all time. Oooh, and a Holocaust themed post? That is going to help me immensely! I have a strange tendency to like supporting performances a lot more than lead, but yeah, Fiennes' performance is the best I've ever seen. Milkshake comes veeeeeeeeery close though! Ruth - Well it's great that you watched the whole thing, because it is so marvellous! After a second watch I could probably watch this over and over, but it will never be a happy experience. And Liam made me cry too! Aditya - Ralph Fiennes is freaking awesome. I'm going through a bit of a Liam/Ralph phase at the moment, so I'm sifting through their films as well. I've seen a few pics of the real Amon...he was very creepy looking, wasn't he? And yeah, I've seen that picture. Ralph did well in making himself look the same. One of the greatest movies I've seen too, and definitely the best Spielberg out there. It's a great film indeed, I rewatched this last week and was blown away by it again. Liam Neeson, Ralph Fiennes, Ben Kingsley all at the top of their game. I agree Fiennes' performance is up there as one of my favorite of all-time as well. How could you not be blown away by it? I loved all of the performances, but Fiennes is amazing!